Today's guest post is from Susi, a writer for Arcadian Lighting. Founded in 2002, Arcadian Lighting started selling decorative home lighting fixtures and lamps online, and has become one of the top Internet retailers for home lighting products. Visit their website and cool blog for more information. No matter the season, classic coastal inspired interiors can work year round. 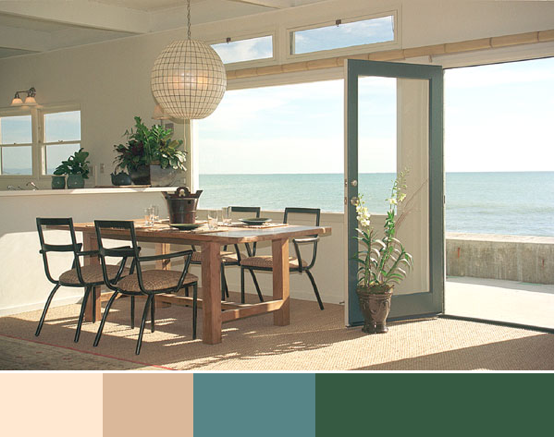 Gorgeous seaglass, the beachcomber's treasure, is a fantastic palette for a coastal interior. Blues, greens, whites and browns recall warm days spent at the beach. The most common colors of seaglass are white, green, and brown, but it is blue seaglass that most of us think of when we imagine seaglass. This living room has a lively mix of seaglass colors. Green seaglass comes in a range of hues from deep bottle green to pale citrus green. Bottle green walls and curtains make the bright blue accents pop in this dining room. The most common seaglass is white in color. It begins its life as clear glass and the color comes from the pummeling of sand over time. Matte white with sparkling blue glass accents give this dining room the look of seaglass. Warm woods look perfect next to seaglass colors and recall the beaches where seaglass is discovered. The warmer tones of the wood are a nice complement to the cooler blue and green tones. Even one of the lovely vintage light fixtures is touched by a seaglass blue. Seaglass blues and greens give this bedroom beachside charm. The onion pattern of the headboard also reminds us of the organic shape of seaglass. Pale blue painted furniture with an aged finish is inspired by coveted blue seaglass. 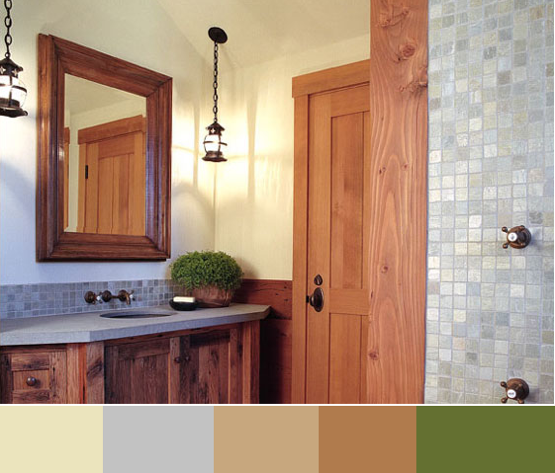 Warm toned accents along with deep greens turn this entry into a lovely seaglass inspired space. Pale buttery cream is a lovely neutral to pair with seaglass colors. Blue and greens stand out against the yellow undertones. Crisp white is the perfect accent color. Discover even more perfect sea-inspired light fixture†products and design ideas by visiting Arcadian Lighting's website today! 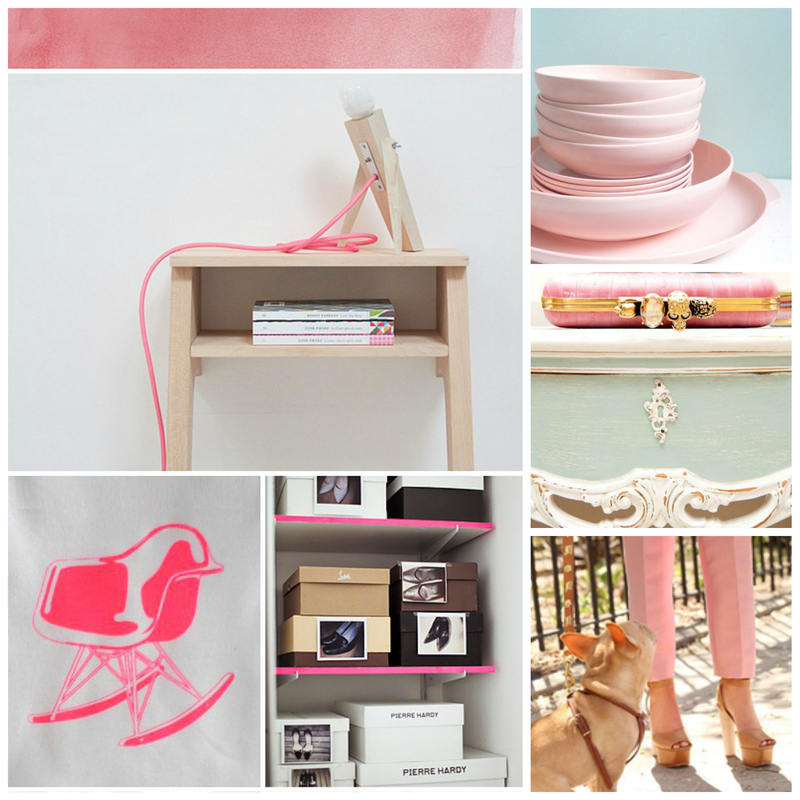 Today we are interviewing a budding interior designer with an eye for style and a love for interiors. 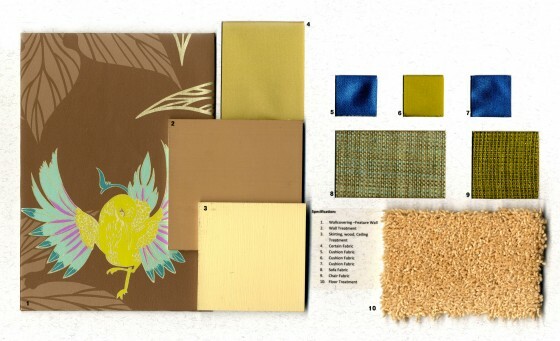 Make sure to check out her interior design blog and portfolio at HOP Interiors. Ok, let's get started. Hi COLOURlovers ladies and gents! 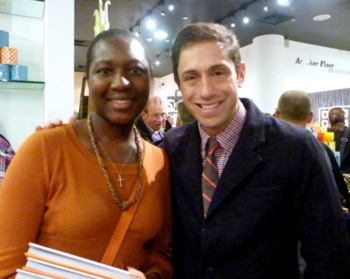 I am Mary-Ellen Paul, Editor & Founder of HOP Interiors. My creative interiors blog is my platform to share my thoughts, personal style and design aesthetic. My passion for interior design has been an immense contributing factor. When you have the passion you are more likely to take the bold risks needed to succeed. Through my passion I am continuously seeking to develop my knowledge of interior design, taking risks with colour and exploring its effects. I think that bold strong colours will push through this year such as cobalt blues, bright yellows and fiery oranges and tangerine. In a contrast to that, pastels will start popping up, lots of sugary tones of pinks, greys and blues, will be coming through this year. What patterns and trends do you think will be big in 2012? 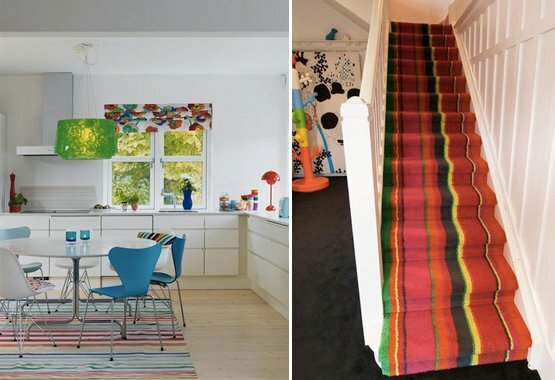 There seems to be a lot of the iconic zig-zag Missoni style print which has segued into the interiors stratosphere. Simple prints with both bold and subtle colours will shine through too. 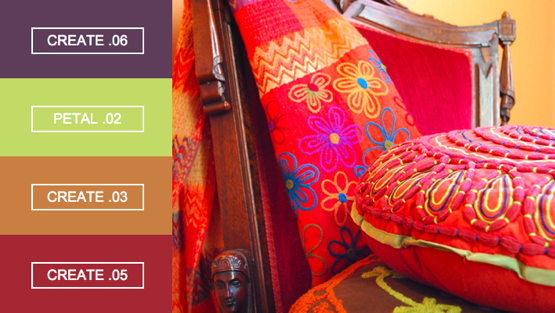 Which colors, patterns & trends are you personally most excited about? Cobalt and Navy blues are my favourite colours but I always enjoy designing with colours I’m not used to – taking me out of my comfort zone. When I’m stumped I tend to take a break from it. I go through loads of magazines, tearing out anything that fits into my idea and then build upon that. What is your favorite website or app right now? At the moment I’m addicted to the Pintest app. 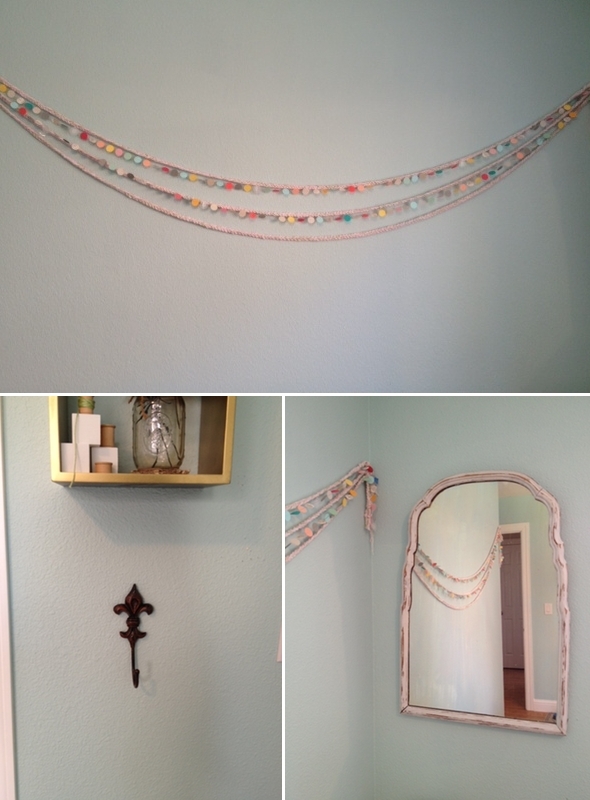 I also adore decor8 as Holly is immensely inspirational. I use housetohome.com for inspiration for images for a particular space, be it the living room or the bedroom. 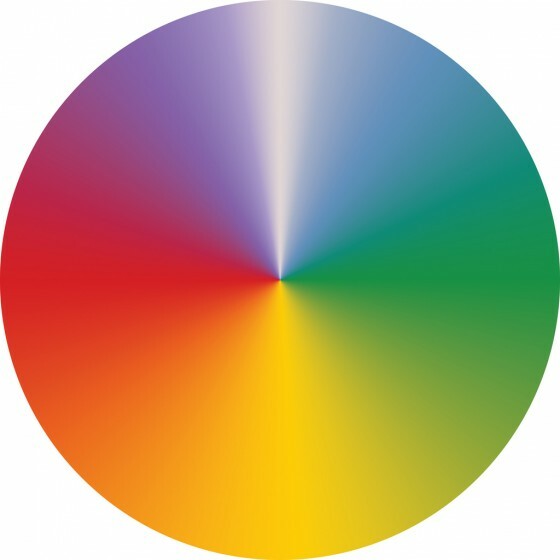 When decorating your home, what are the top three colors you turn to for the space? When decorating a space in your home it’s vital that you assess the space for its size and the amount of light it receives. The more light it receives, the cooler the shades, the less light it receives the much warmer the colour may be used (interior design 101). 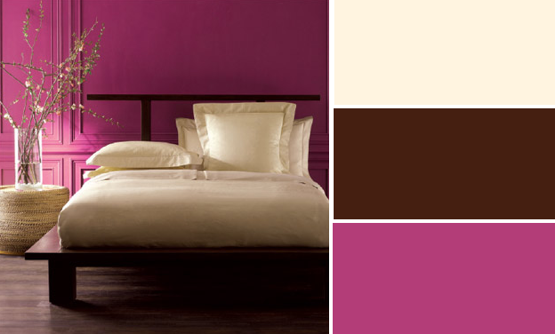 The colours I tend to use most are Night Jewels, Velvet Truffle and Cocoa Blush – colours from the DULUX paint range. 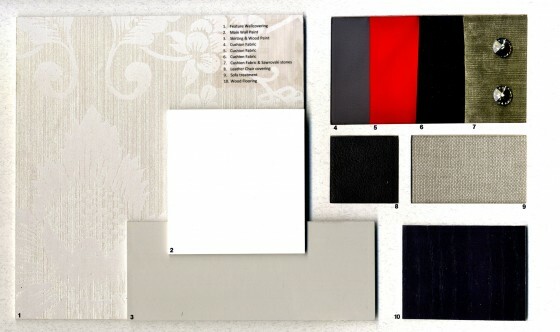 However my fabric choices for my last interior project did encompasses rich reds and lush silver tones. 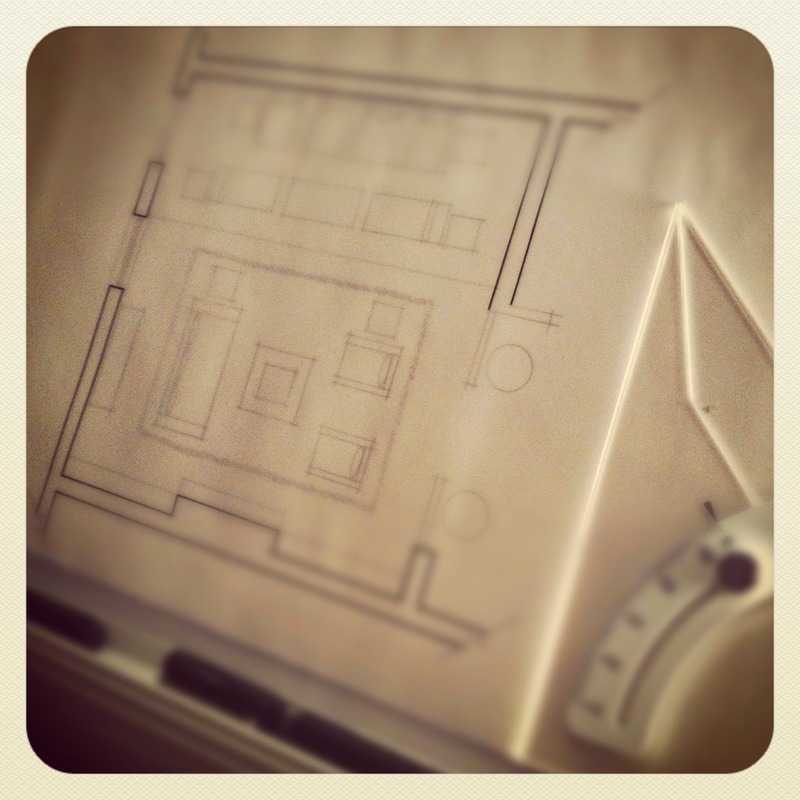 What's the best home design-related advice you've ever received? If in doubt, always go back to the brief. The brief is the central core to any interiors project. When designing a space in your own home try writing a brief, detailed statement of what you want and don’t want to include in the project. This will be your blueprint to refer back to. There may be times when your eyes go into interior overload with so much choice out there, but if the products and colours you choose do not relate to the brief or the ethos of the scheme then it’s a no-no. For someone that is just beginning down the rode to create a better home, what resources or advice would you give to them? One of my mantras is that ‘a room must not only look great, but feel right’. The room must be right for you, it must be comfortable and feel just right for you. There are so many fads and trends but instead of going with the flow I would advise going for that is right for you and your home. When embarking on a better home or a redesign I would advice taking it one step at a time. It’s easy to get carried away and so my advice would be to slow down and take it room by room. If you are unable to do a complete redesign you can always add a few little changes to make a room appear brand new. 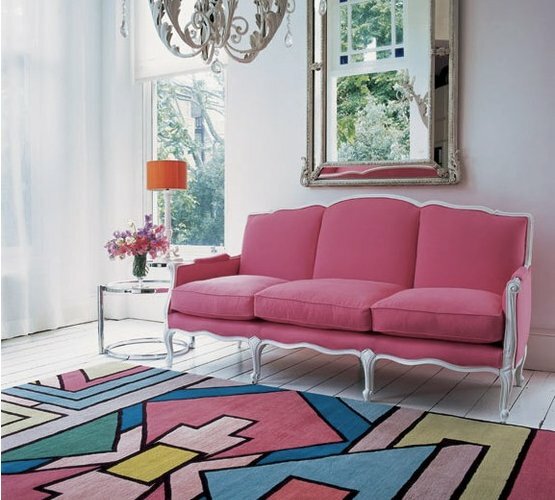 For example, you can add a new splash of colour to your room or a change of colour to your fabrics and textiles. My blog will give you a lot of handy tips on making changes to certain rooms in the home. I was on the hunt for about 6 months looking for the perfect color for my bedroom. 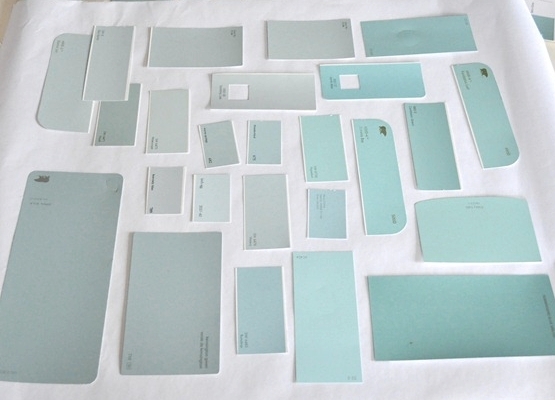 After such a hunt, I realized there probably isn't a perfect "Robin's Egg Blue" that fits each and every room or piece of furniture. 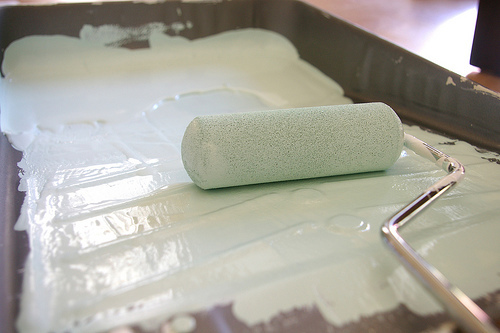 Many people in the blogosphere have talked about their quest in finding the perfect paint color. I checked out every single one of those blog posts and tested every single one of those colors. Unfortunately for me, none seemed to fit just right. So the search continued and I finally found the perfect color. I was looking for something like the bedroom above on the right or something like this bookcase below. To me, this color is a warm blue tone that is subtle yet inviting. I was coming across either icy colors, baby blue colors or just bright blue tones which I didn't want. Since I wanted something warm, it needed a hint of green to soften the tone up just a little. 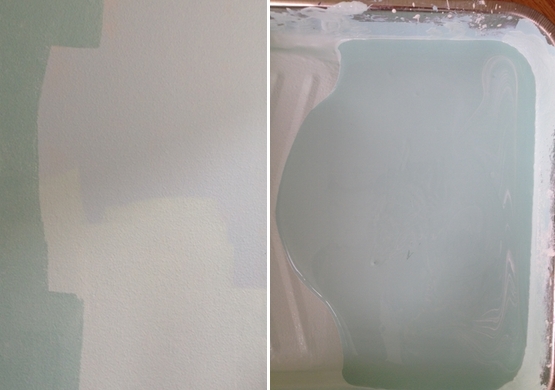 Centsational Girl talked a lot about finding the perfect Robin's Egg Blue paint color, and I must say, she did a lot more research than I did! I mean, check out all those paint swatches! 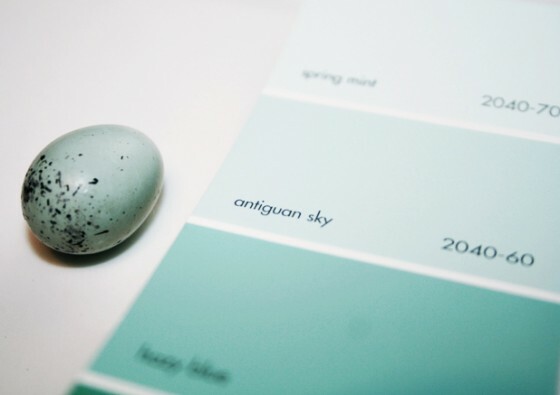 Red Bird Cabin suggested "antiguan sky" from Benjamin Moore. And now, it was time to try all of these samples on the wall. I choose tried 4 different paint colors. As you can see, some were not quite what I was expecting when I opened the can. None the less, I tried them all on the wall to see the results. The runner up was "Bird's Egg Blue" by Benjamin Moore. It was a tiny bit too blue for me, so I decided to jump over to the next swatch which had a little more green in it, "Antiguan Sky" from Benjamin Moore. This ended up being the perfect color for the wall! The room isn't done being decorated yet, but check out the overall color on the wall. 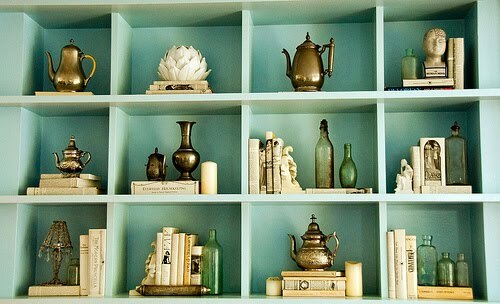 It is the perfect mix of blue and green and offers a warm feel in the room. Do you like the final color? 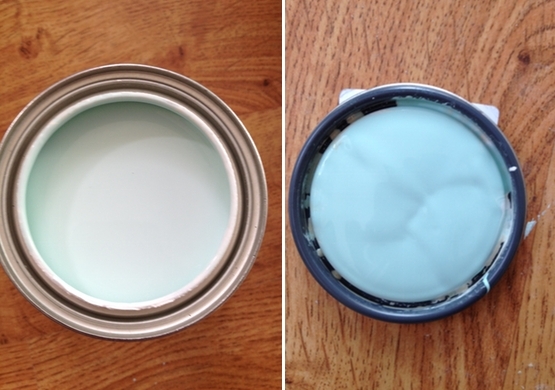 Are you in search of the perfect Robin's Egg Blue color? Which ones have you tried? If you enjoyed the color found here, check out our digital marketplace for ones you can download right away with Creative Market. An influential designer that I would like to shine the spotlight on would have to be Jessica Helgerson of Jessica Helgerson Interior Design. Several years ago I stumbled across her work, which I found to be organic as well as aesthetically pleasing. Looking through her impressive portfolio, you can see where she is very versatile as opposed to sticking to just one style or look. Also, the fact that Jessica works in an environmentally conscious fashion does not hurt either. Being able to work with a wide range of styles, being earth friendly at the same time, while executing such timeless and tasteful spaces is a skill in itself and is something that should be commended. 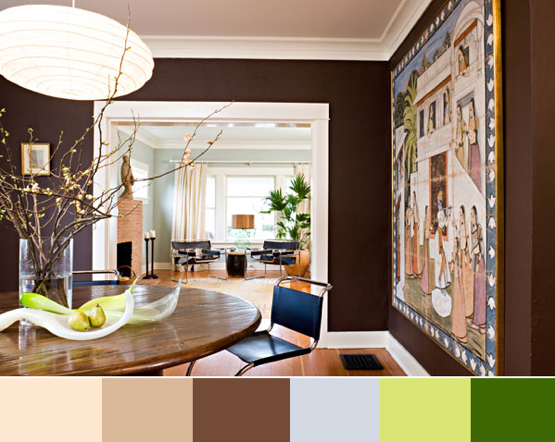 color palette was inspired by the surrounding land of this beautiful home. 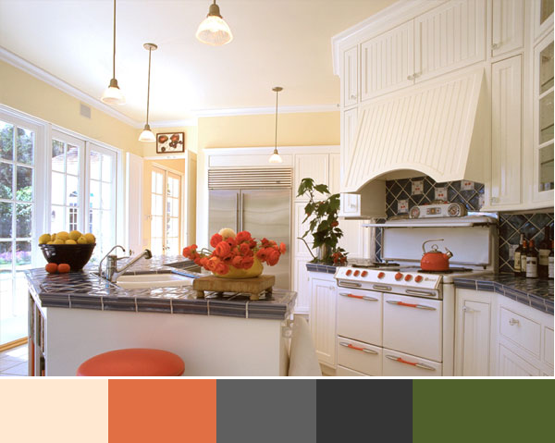 Loving the use of orange to add a nice taste of color in this bright and airy kitchen that was inspired by Swedish design. A dining room with great large windows that allow plenty of natural light to come in while that are great for viewing that serene ocean. Greens and beiges were used, definitely inspired by the nearby beach. 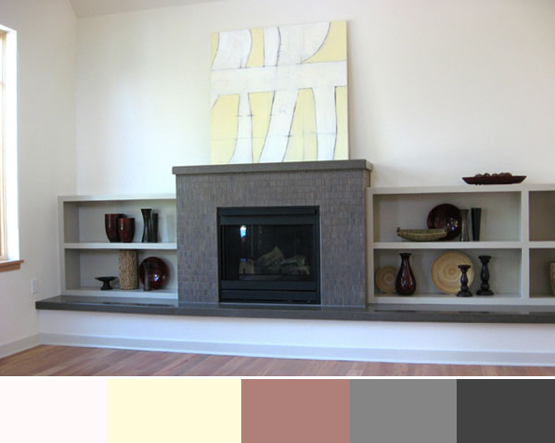 A serene living room with a charcoal gray fireplace and smart built-ins. 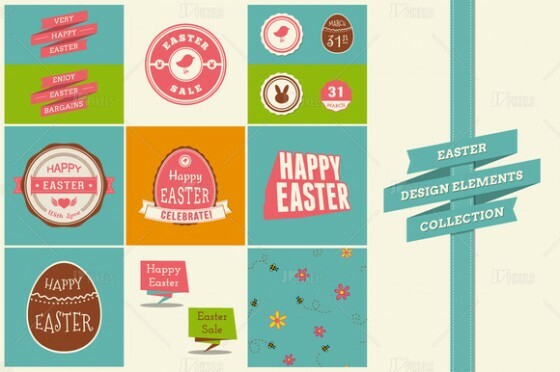 What do you think of these bright and fresh designs? Is this your style or would you go for something a bit more bold? Uniting all dish towel lovers for this post. If you're not a fan of awesome dish towels, it will suffice if you are a fan of really cool patterns printed on textiles. If you haven't checked out the online shop Leif, make sure to do so. They have some incredibly unique and really cool stuff on their website from decor accessories, paper, candles, and much more. I found a fun collection of items that are sure to spruce up any kitchen quite fast. The paint chip placemat is a perfect addition to any table. And, it comes in different colors, so you can mix and match or just play it safe with one color all around. 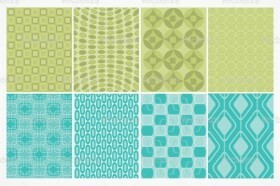 Leif definitely covered all the popular patterns of the moment in their textiles section of this online shop. Houndstooth is becoming an increasingly popular option, and I think this design and color palette would surely brighten up any room, don't you? Cityscapes! Talk about a different take on a cityscape. Great addition to my tea towel collection. 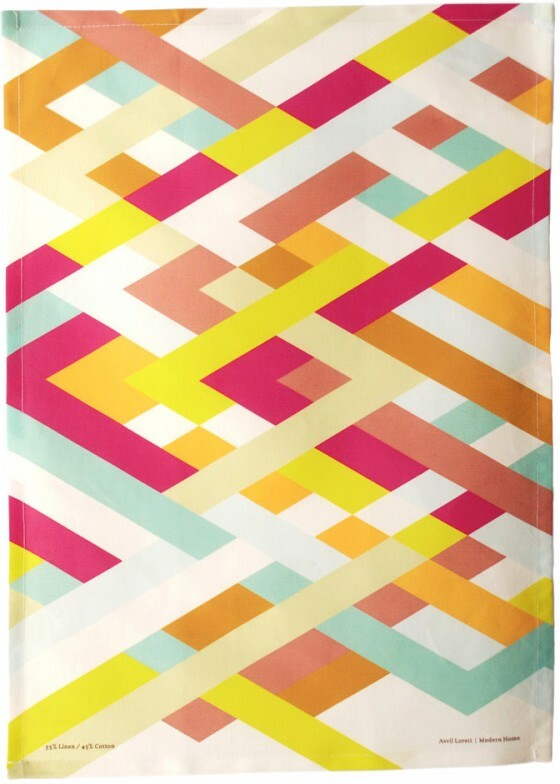 I love the bright colors in this lattice design. This might just be my favorite, if there was a way I could choose a favorite. And just for fun, I love their take on bottles that we have all the time in our home anyway. These vases were created from dish detergent and yogurt bottles. Awesome. Which pattern your favorite? And do you love these vases? 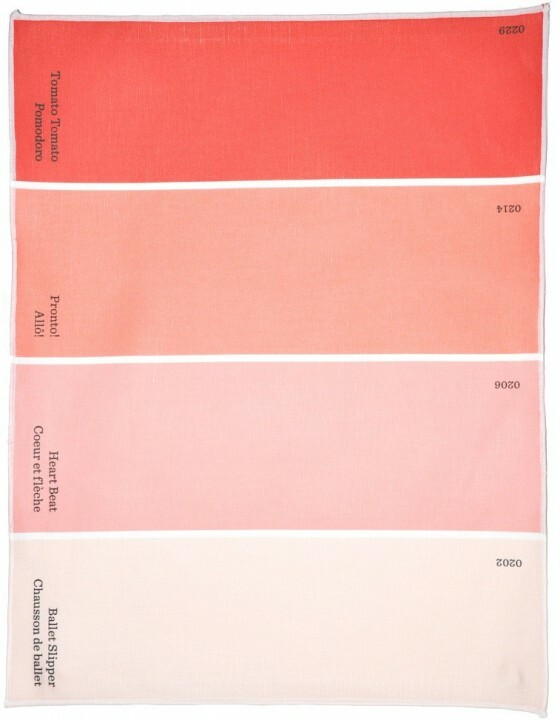 Now it is your turn, create some fun palettes from these cool dish towels. Comment to let us know your thoughts and make sure you pin your faves! As we become more aware of how things affect our environment and about earth-friendly living,a huge focus has been geared toward non-toxic paints. Being an Interior Designer, I am by any means not a paint expert, but have done some research and have come across some very interesting tidbits that everyone should be aware of, if they are not already. I have learned that the majority of paints have a degree of toxicity, only egg tempera can really be accepted as completely non-toxic if using non-toxic pigments. Egg tempera is basically pigment paste and egg yolk. The benefits of non-toxic paint are that they are ideal for those with allergies, have a low-odor and are ultimately better for the Earth. I'd like to emphasize chalkboard paints which are huge right now. This is perfect for kids and have come across some non-toxic paint that come in black, green, red and blue. This brand of paint was created by Sibella Court who teamed up with Murobond paints. So if you are interested, you can click here to get more information. There are so many brands and types of non-toxic paints that would fit your needs. I have found just a few that I hope you will seem to find interesting. We should not only celebrate Earth Day one month out of the whole year, but everyday. A soft color palette of organic paints by ECOS Organic Paints. 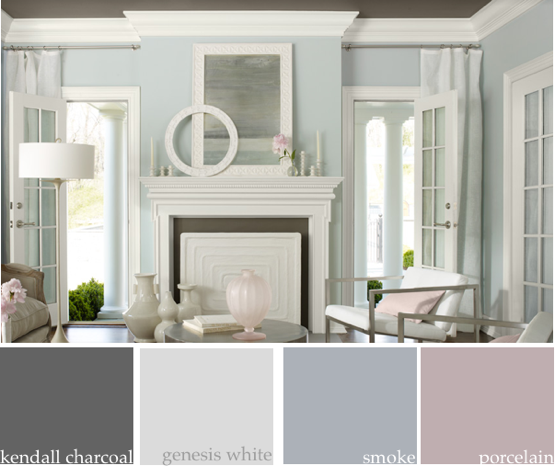 Benjamin Moore's Natural Paint Colors. 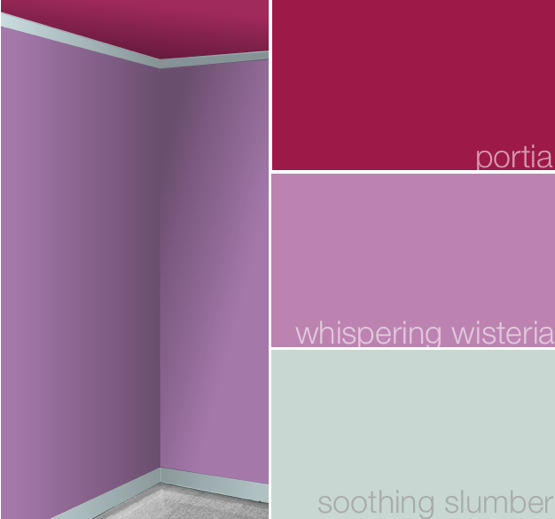 Image from Mythic Paints room visualizer page. Spring is upon us and with that comes the need of much more color in your life. 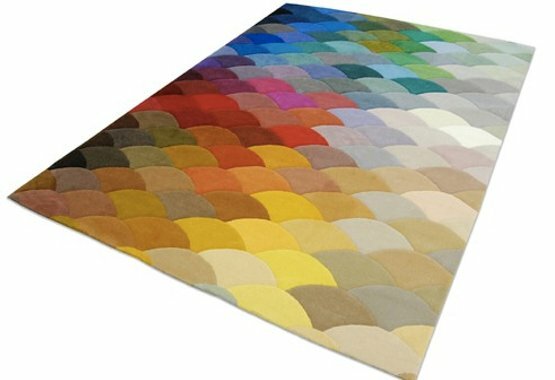 One way to add more color into your home is by finding the most colorful and creative rug to fit your home. 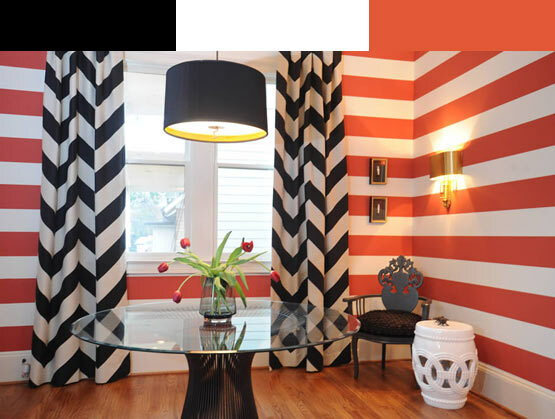 This dose of color will brighten up any room and will definitely brighten your spirits along with it. Whether you are looking for a solid color or want to add a little extra pattern into any given room, there are so many different styles and ideas that you can sure to find something fabulous to fit in with your current palette. 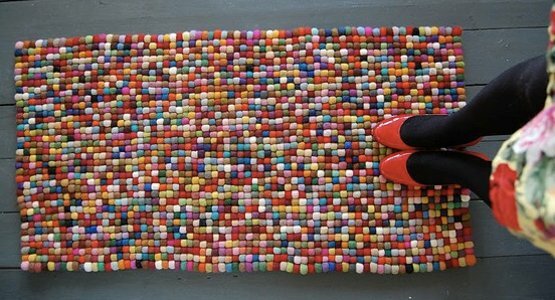 This colorful rectangle rug is made of felt balls. Genius huh? 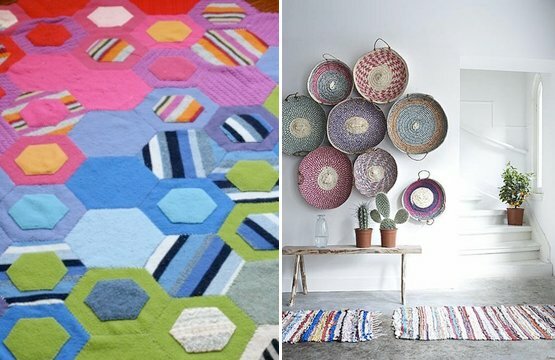 Such great colors and a pattern made among colors is perfect for a welcome mat or even as the focal point in the living room. 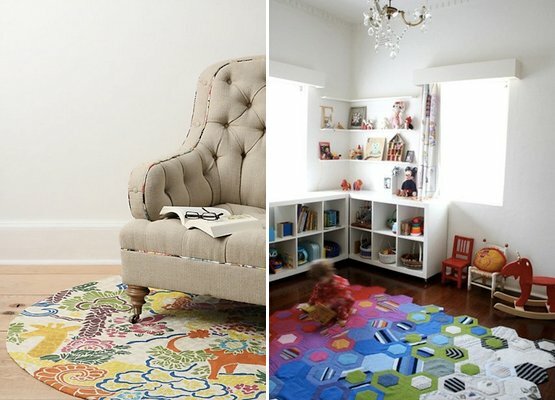 Here are a few different takes on color and patten when it comes to rug shopping. Both are completely unique and would definitely get noticed where ever you chose to lay it down. The thing I love about this next photo is how the piping on the chair matches the colorful feel of the chair. 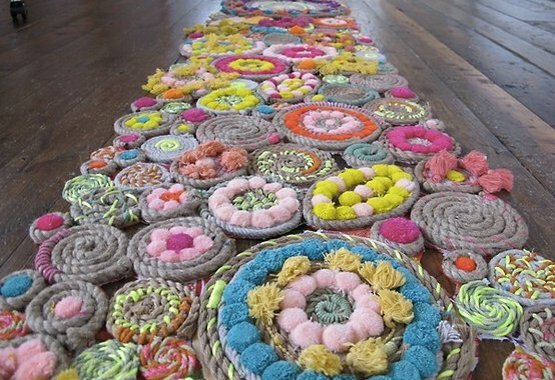 These colorful rugs all offer something fabulous to a space. 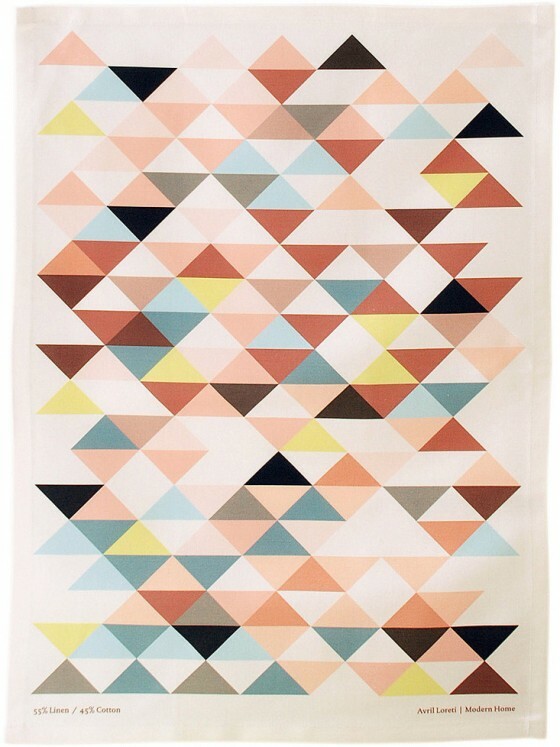 You can easily spruce up any room, mundane or not, with these awesome rug designs. 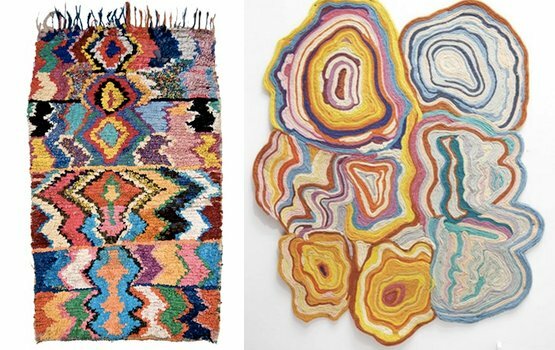 And these definitely aren't your grandma's rugs. These are modern and hip and create the space definition that everyone needs in a room. 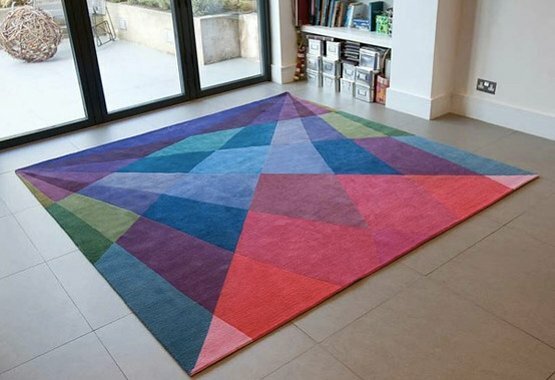 Looking for something geometric to fill the space? Any of these pieces would fit perfectly to give your room that awesome colorful glow in a modern way. 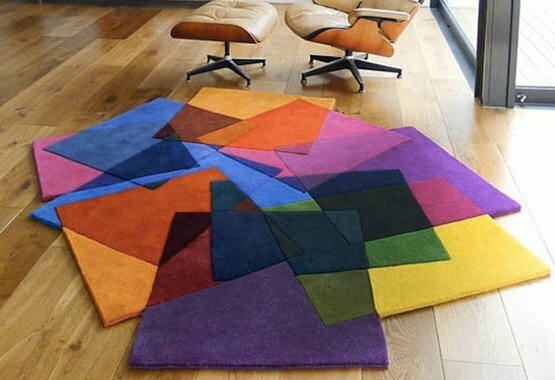 Rugs are a great addition to a room because it creates that great definitely in any room. Whether it be under the kitchen table, in the living room or practically any other space in your home. 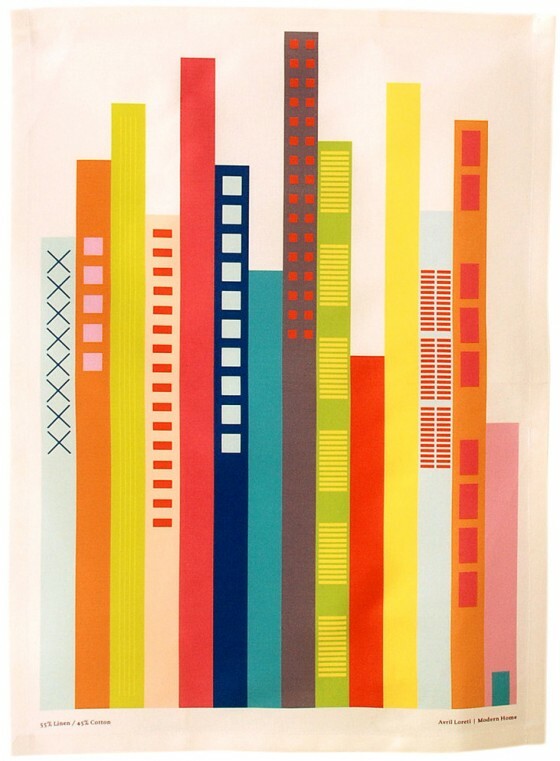 And these colorful pieces would spruce up any room and any attitude with a lot of color. Which are your favorite pieces? Where would you put these in your home? Hello everyone! Chloé from Plenty of Colour here again. 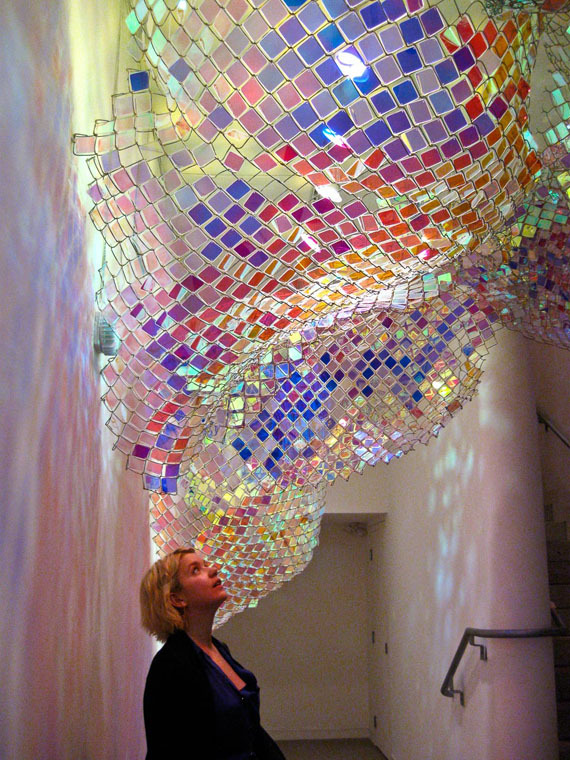 I am a major fan of art installations, especially when creators turn an everyday object into something breathtaking. 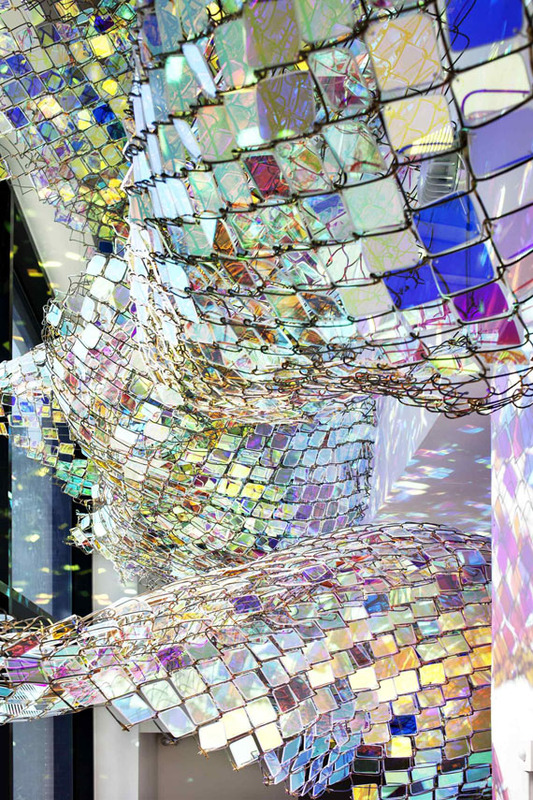 An example of making the mundane magical is this beautiful piece called “Capturing Resonance” by sculptor Soo Sunny Park and composer Spencer Topel. 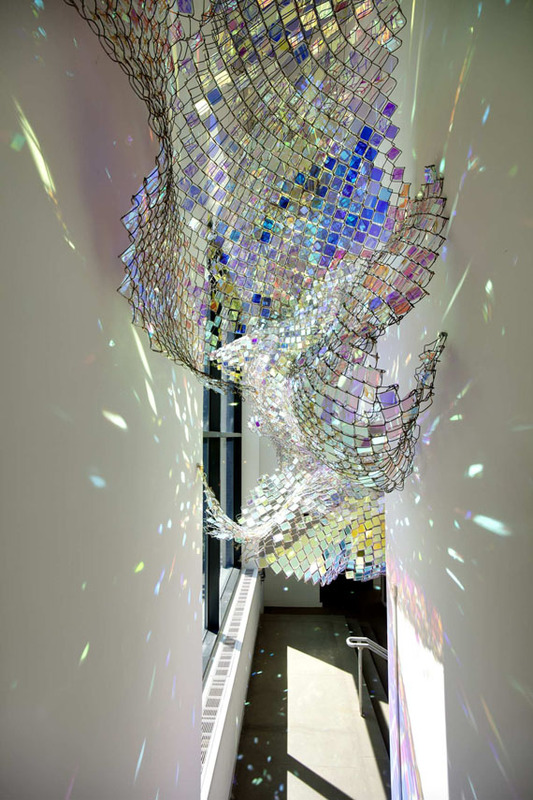 Featured at deCordova Museum, the colourful and iridescent installation feels like a work of exquisite glass. 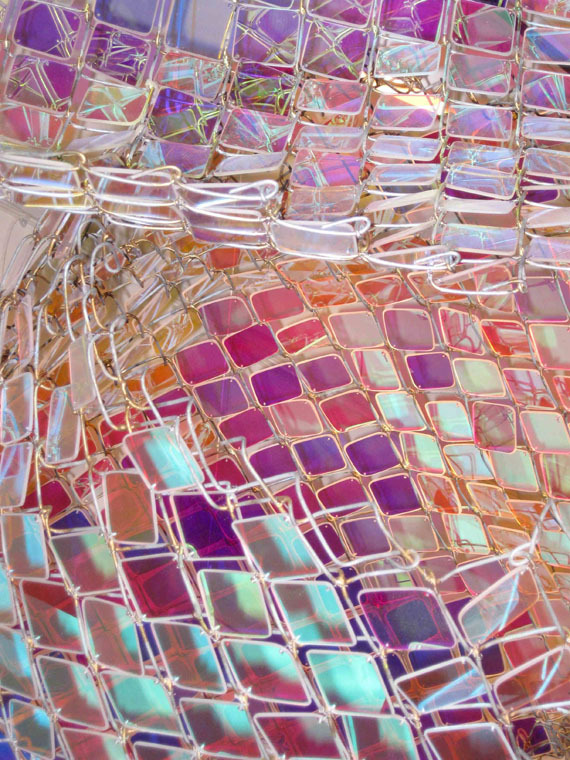 In fact, Park created the undulating textile by inserting thousands of acrylic squares into chain link fencing. 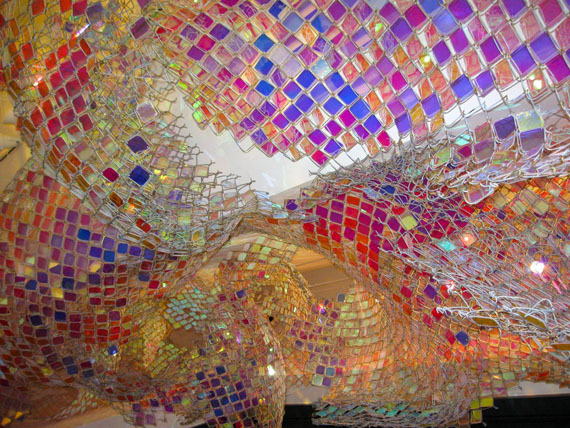 As “Capturing Resonance” was created in a window-filled space, different lighting makes the piece a constantly evolving palette of colour, shadows and reflection. 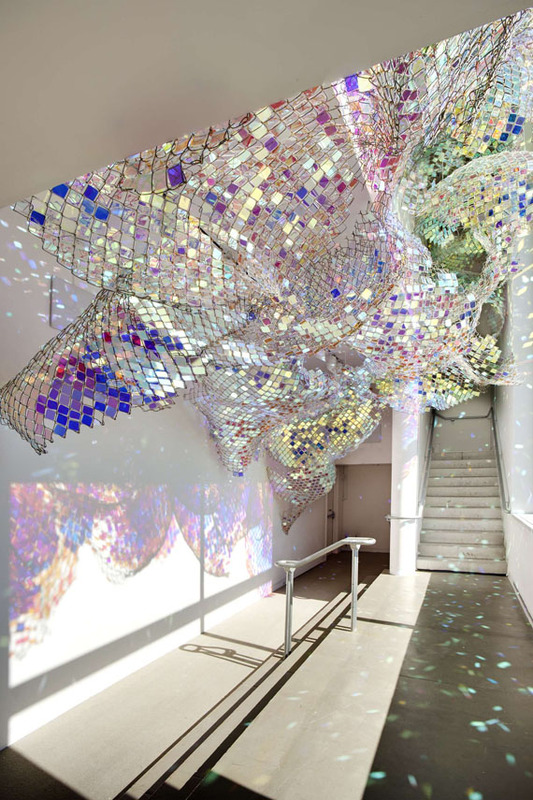 The installation also features an audio element as composer Spencer Topel created an dreamy, elegant composition that is activated by motion sensors so the sound is ever-changing and layered like its iridescent muse. “Capturing Resonance” showcases that any material, no matter how industrial or mundane it may seem, can become a gorgeous piece of art. Every clock will tell you the same thing, but how you want it displayed is what can very greatly depending on your style and even your creativity. Telling time in 3D is not yet something that is common in every household, in fact, I'm pretty sure it isn't common at all. The Manifold Clock hopes to change that. "Time repeats itself, yet it is ever-changing. It's like watching someone climb spiral stairs - if you look from above you see him going in circles, but if you look from the side you see him advancing." 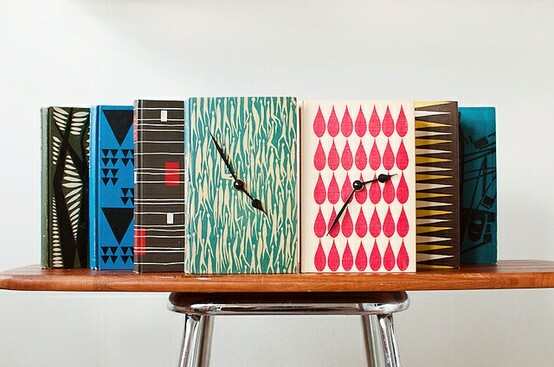 Here are a few clocks that you can easily DIY to spruce up your home. 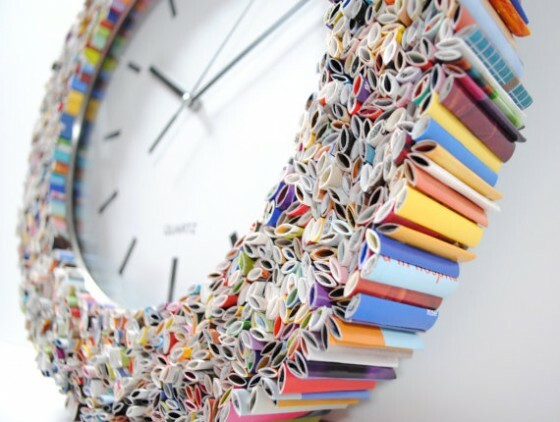 This first one is made of magazine pages, such a fun and very simple DIY to undertake if you are looking to spruce you your current clock situation. 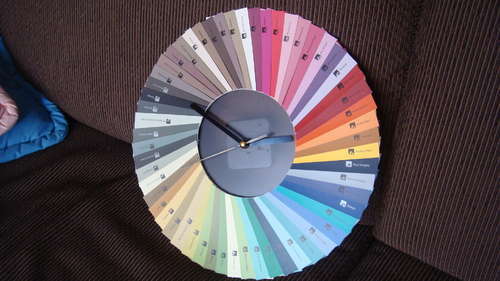 Below is a paint chip clock and a clock made out of books. Time can be told in many different ways, colors and designs. 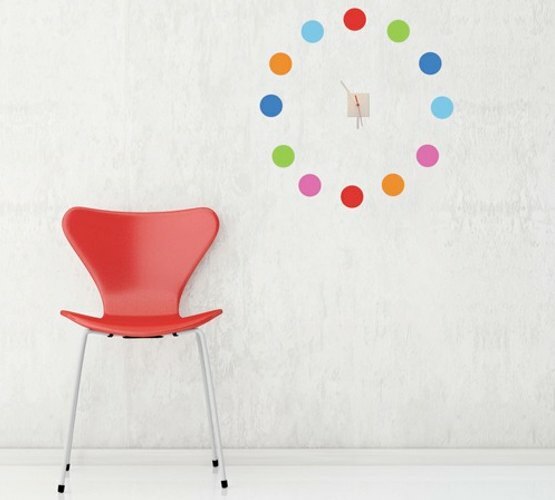 This simple clock simply has color swatches which lends itself to a piece of wall art as well as a clock. A colorful clock made with CSS & JQuery. Here is the tutorial if you want to build one for yourself. 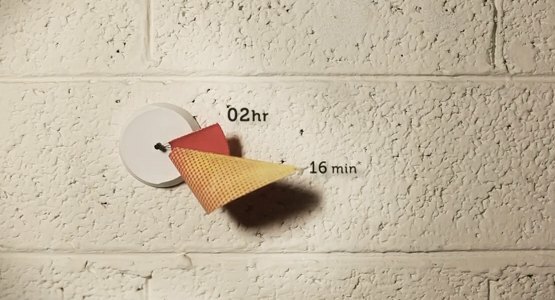 The Present Clock offers a completely different approach to telling time. The idea to to tell time throughout the year to hopefully enjoy the moments you have instead of breaking them into minutes, hours and days. The Present is not available just yet to purchase but I can't wait until it comes out so I can grab one. 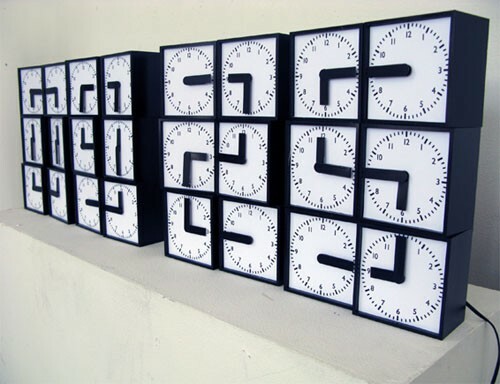 This is a pretty cool way to tell time. Of course time wouldn't always come out like this, but when it does, it looks pretty awesome. 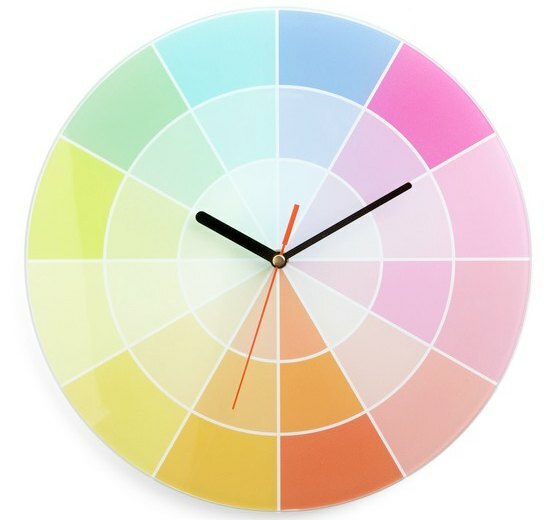 Whether you want to DIY something or just want to add a little more color to a room, a clock is a great dual-purpose way to do so. What are your favorite designs when it comes to telling time? 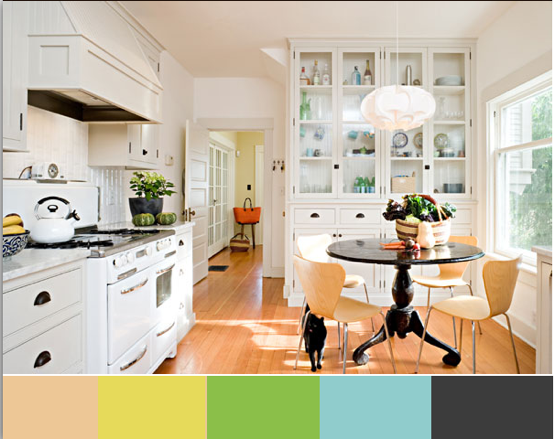 Designing Your Home With Black, White and COLOR! Today's guest post is by Jaime Derringer, Founder and Executive Editor of the popular design blog, Design Milk. I’ve always struggled with color. As you can tell from my website, Design Milk, I love everything black, white and gray so you’re probably wondering what I’m doing writing about color? Well… surprise! I love color! I know you wouldn’t expect it based on my site’s palette, but I’m a huge fan of just about every shade, hue and pigment out there. I’m especially fond of all things multicolor, bold and vibrant. When I was initially designing my website, I struggled with whether I should add color. I went through quite a few options and couldn’t make up my mind. I realized that no matter what accent color or color palette I chose, I’d eventually end up changing my mind, so I opted for no color at all to let the photos in the content become the colorful stars of the site. Nothing makes a color pop more than against a black and white background, so I thought it might be fun to look at some colors that I could have used on my website in addition to black and white. Since Design Milk is a blog all about design, what better way to share color than through design? Like a bumblebee? Yes! But, um, no. 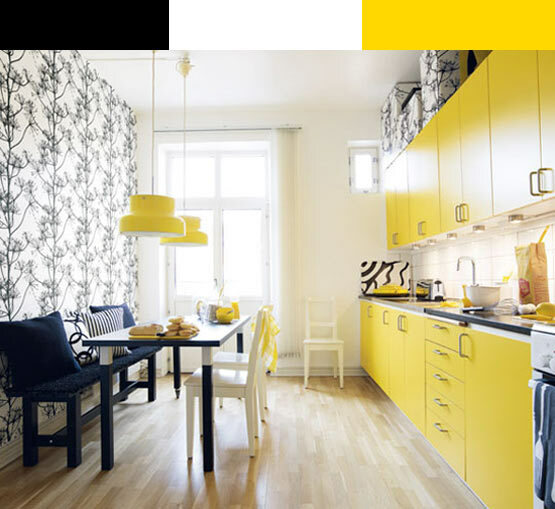 This gorgeous black, white and yellow kitchen looks nothing like a bee! 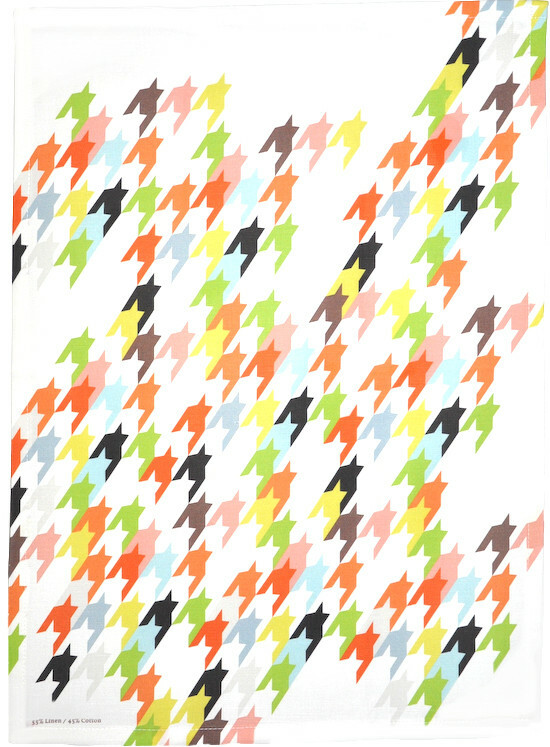 Image from Colorama. 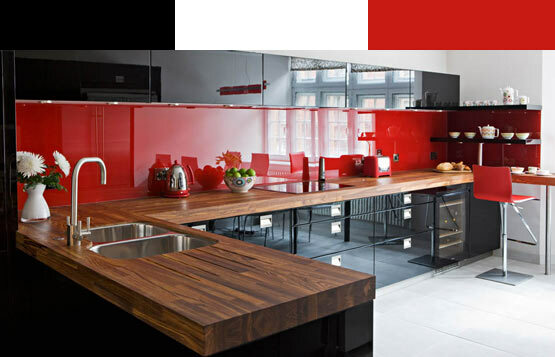 Wow – there’s nothing like a giant piece of red glass as your backsplash to make a huge impact. This design is by Neil Lerner Designs. 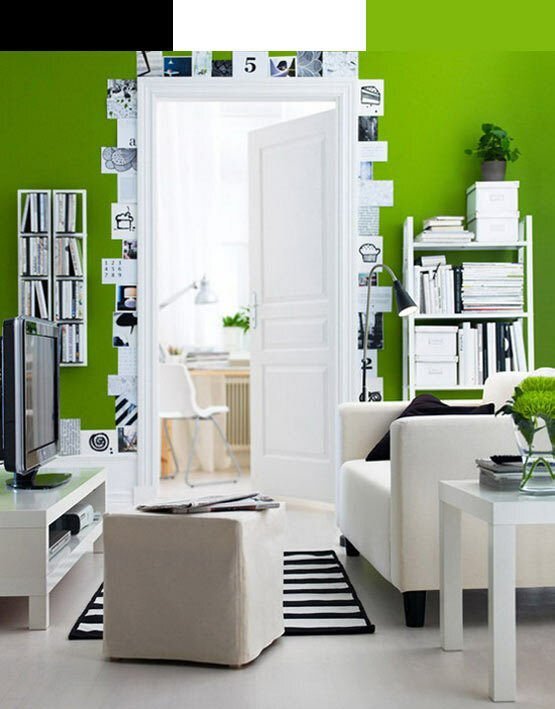 This image, from the IKEA catalog, shows how dramatic a wall color can be. Sometimes simple pops of color aren’t enough and you need to create pattern. 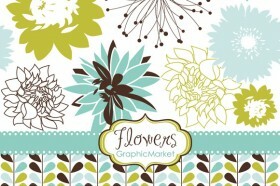 Image from Blount Design. This bedroom from Elle Décor, is a beautiful example of how hot pink accents can change a room’s vibe. 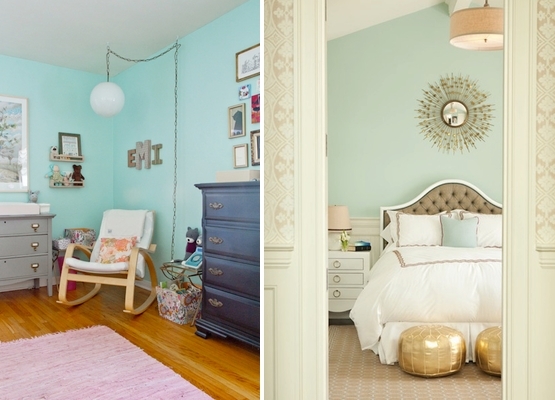 If the pink accents had been navy or beige, just think about how different this room would look and feel.